The binary star system IGR J17091-3624 may contain the smallest black hole known. Scientists discovered it by studying the heartbeat-like pattern of X-rays thought to be emitted from a disk of accreting matter around the black hole. Scientists may have found the smallest black hole yet by listening to its X-ray "heartbeat." The black hole, if it truly exists, would weigh less than three times the mass of the sun, putting it near the theoretical minimum mass required for a black hole to be stable. The researchers can't directly observe the black hole, but they measured a rise and fall in X-ray light coming from a binary star system in our Milky Way galaxy that they think signals the presence of a black hole. NASA's Rossi X-ray Timing Explorer (RXTE) spacecraft measured this X-ray heartbeat in a star system in the direction of the constellation Scorpius, at a distance somewhere between 16,000 and 65,000 light-years away (a light-year is the distance light travels in a single year, about 6 trillion miles (10 trillion kilometers). Researchers think the system, officially called IGR J17091-3624, includes one normal star with a companion black hole. Mass would stream off this normal star and fall toward the black hole, forming a flattened disk around it. As friction in the disk heats the gas to millions of degrees, the disk would emit high-energy X-rays that can be seen across the galaxy. As changes occur inside the disk, cyclical variations can be seen in the X-rays streaming from it, which pulse in varied intensity like a heartbeat. "We think that most of these patterns represent cycles of accumulation and ejection in an unstable disk, and we now see seven of them in IGR J17091," researcher Tomaso Belloni of the Brera Observatory in Merate, Italy, said in a statement. "Identifying these signatures in a second black hole system is very exciting." The astronomers recognized the signal from this system because of its similarity to another black hole system called GRS 1915+105 that pulses in much the same way. This other system contains a black hole that weighs about 14 times the sun's mass, which sends out X-rays in highly structured patterns that last between seconds and hours. 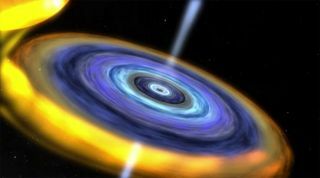 In comparison, the newly observed system has an X-ray heartbeat that pulses 20 times fainter than GRS 1915 and cycles back to the beginning of the pattern about eight times faster, in as little as 5 seconds. "Just as the heart rate of a mouse is faster than an elephant's, the heartbeat signals from these black holes scale according to their masses," said Diego Altamirano, an astrophysicist at the University of Amsterdam in the Netherlands and lead author of a paper reporting the findings in the Nov. 4 issue of the Astrophysical Journal Letters.